In this brilliant new work, Amanda Vickery unlocks the homes of Georgian England to examine the lives of the people who lived there. Writing with her customary wit and verve, she introduces us to men and women from all walks of life: gentlewoman Anne Dormer in her stately Oxfordshire mansion, bachelor clerk and future novelist Anthony Trollope in his dreary London lodgings, genteel spinsters keeping up appearances in two rooms with yellow wallpaper, servants with only a locking box to call their own. Behind Closed Doors was an interesting, if not always entertaining, read. When I chose this book, I had imagined something different from what I was presented with between its pages. I had hoped for a lot of detail on Georgian life, but instead I found discussions of wallpaper and architecture. All interested in its own way, yet hardly what I'd had in mind. 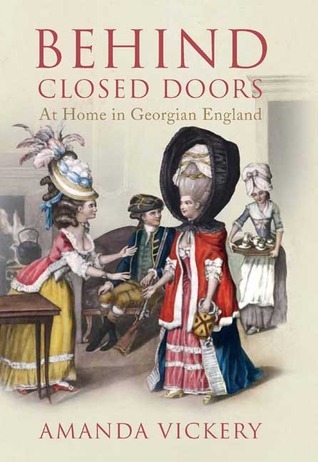 I would not recommend this book if you are hoping to find out about Georgian meals, fashion etc. But I can recommend it to those looking for social commentary with regards to gender roles in the Georgian era. On that it was very informative, the only area noticeably lacking being on Molly Houses and their ilk. Overall, I still give this four stars. Though not what I'd expected, it was well-researched.